When visitors first arrive in Helen, Georgia with its cobblestone streets and hundreds of Bavarian-styled local attractions, it's easy to get caught up in all the things there are to do. However, what makes Helen unique is that it's also the perfect “home base” for your explorations around North Georgia. After a long, fun day of hiking, tubing, playing, and exploring the many Helen attractions, you may be looking for a more relaxing activity. Are you in need of a break, but not ready to settle down for a soak in your cabin's hot tub? 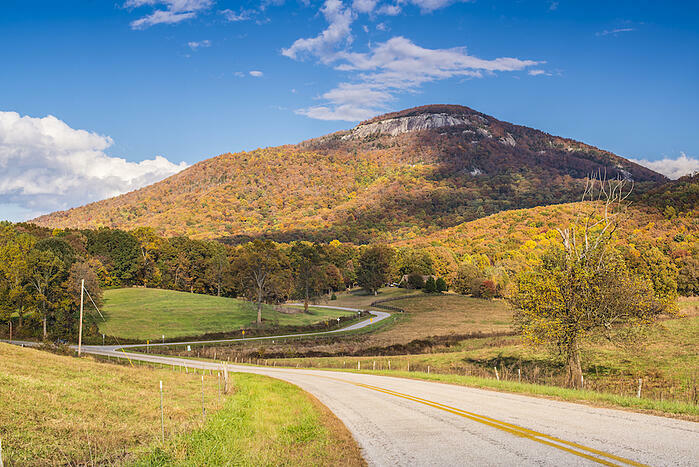 Pack up the family, and maybe even a picnic lunch or dinner to enjoy on one of these three scenic drives through northern Georgia. State Route 348, otherwise known as the Richard B. Russell Scenic Highway, offers majestic views of the northern Georgia landscape for your entire family to enjoy. The highway begins only minutes away from most cabins in Helen, and is a "must see" during your vacation experience. Your eyes will never grow tired as you take in the incredible sights of breathtaking mountain scenery, lined with vast timberland forest, wildlife, and sparkling waterfalls. As you travel higher and higher up the Richard B. Russell Scenic Highway, you will have a bird's eye view of Helen and the surrounding areas for an experience like never before. The highway comes to an end at the highest peak in all of Georgia. This area, known as Brasstown Bald (also called "Enotah" by the Cherokee peoples), is located at four thousand seven hundred and eighty-four feet high above the sea. Here you will get a unique simultaneous look at four different states. See if you and your family can differentiate between the states of Georgia, Tennessee, and both of the Carolinas. Brasstown Bald, or any of the magical locations along the Richard B. Russell Scenic Highway are ideal for a family picnic. For nature lovers, the Cohutta Loop is the ideal spot for a scenic drive. Providing nearly seventy square miles of northern Georgia wilderness, this drive provides you with access to the largest wilderness area located east of the mighty Mississippi river. It has with babbling brooks, vast timberland forest, and an incredible variety of plant and animal wildlife. The road takes a steady climb which leads to breathtaking vistas. The Cohutta Loop driving trail begins in the southeastern corner of Tennessee on Highway 251, along Tumbling Creek. This road eventually merges into Old Highway 2 which is a historically significant path, as it follows one of the very first routes across the Georgia mountains. Cherokee tribes initially followed the course and led to the settlement of Native American communities within the wilderness area. If time and energy permits, you may consider taking a hike on the Songbird Trail which you will reach by way of Old Highway 2. The Forest Service created this trail. You will be delighted to find that there are so many beautiful, winged creatures singing their songs that it will be nearly impossible to distinguish their calls from a symphony. All along this trail or on the drive itself are some of the most incredible views that you will see in Northern Georgia. For nature lovers, the Cohutta Loop is the ideal spot for a scenic drive. Providing nearly seventy square miles of northern Georgia wilderness, this drive provides you with access to the biggest wilderness area located east of the mighty Mississippi river. Regardless of your vacation schedule, the Georgia Mountain Parkway should surely be a part of your trip itinerary. It is a quick and easy drive that leads you through the famed backcountry of northern Georgia. Low on traffic and high on breathtaking scenery, this route is a definite must. The Georgia Mountain Parkway begins as GA 515, otherwise known as the Appalachian Development highway. All along the parkway, you will enjoy the fantastic mountain and forest scenery, as well as pass through several quaint towns and villages. Dotted with lakes, wildlife, and historical landmarks, the parkway has something for everyone. The southern Appalachian Mountains offer some of the most stunning scenery and natural vistas of anywhere in the US. It's no wonder the area is one of the top tourist destinations in the United States, with miles upon miles of mountains, forests, streams, along with a wide range of historical attractions. And Helen is right in the middle of it all, with a wide range of inviting hotels and mountain cabins! Tallulah Falls features some of the most spectacular natural waterworks in the country, plunging into a thousand-foot chasm that carved in antiquity. With six amazing waterfalls, Tallulah Falls once rivaled Niagra for sheer spectacle (But we think the Niagra Falls just got a better agent). There are miles of hiking trails all around the park, as well as a spectacular suspension bridge that may not be for the faint-of-heart. However, from its center, you'll see sights that you'll remember for the rest of your life. If you're headed to Helen in October, you're in for more treats than just Oktoberfest! Nearby Unicoi State Park, and its spectacular central lake, with trees covering nearly every bank, it's considered one of the single most beautiful locations in the country to see the fall colors. On a clear day, the reflections on the lake look like an Impressionist painting come to life. Unicoi also features more than 12 miles of hiking trails and 8 miles of biking trails, fishing docks, and boat rentals for exploring the lake. It is one of the most stunning natural attractions in an area known for its natural wonders. So, maybe one could get tired of the above ground sights around Northern Georgia. In that unlikely case, head underground instead! The area was home to one of the first gold booms in the US, although the next California strike eclipsed it. The region is home to several historical mines. At Consolidated Goldmine you can go on a walking tour of an actual turn-of-the-century mine, with a live guide taking you through the struggles of 19th Century miners. Ultimately, you'll travel more than two hundred feet underground, and more than one hundred years back in time! Want to see Georgia without getting out of the car? The entire area has scenic driving routes, but our favorite is the Foothills Loop. It's over one hundred miles of mountains, streams, with beautiful colors as you weave between little slices of Americana scattered around the area. There's less traffic than on some of the more popular corridors, but you're always on sturdy paved roads the whole way. To take in a lot of the natural splendor of Georgia in a single day, a drive around the Foothills Loop will fill your camera before the day is out! 5. Or, See It ALL... From The Air! Why drive at all when you can take to the skies instead? 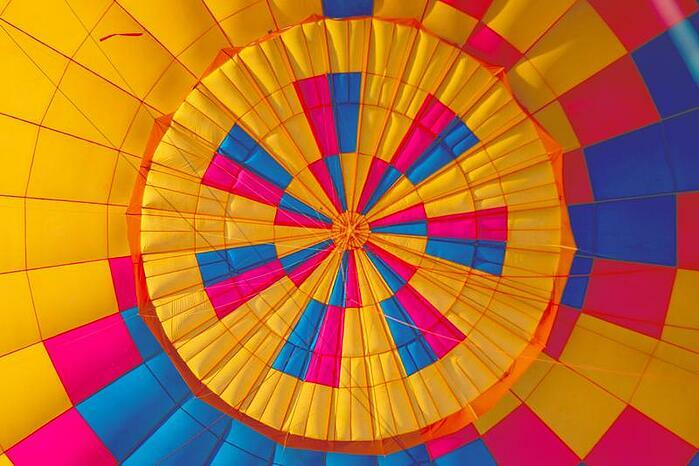 At Balloons Over Georgia, you can go on the ride of your life while getting views that are on offer in several different places. From the peaks of the Appalachians, all the way down to Atlanta, the Helen area may genuinely be best seen from the air. 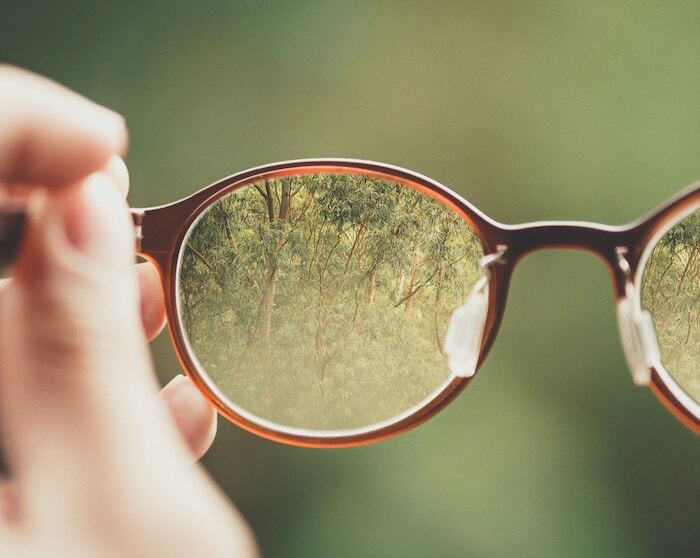 With so many meticulously-maintained parks and attractions around the area, you could practically be looking back into a simpler time, when the bounty of the forests and mountains were all we needed. 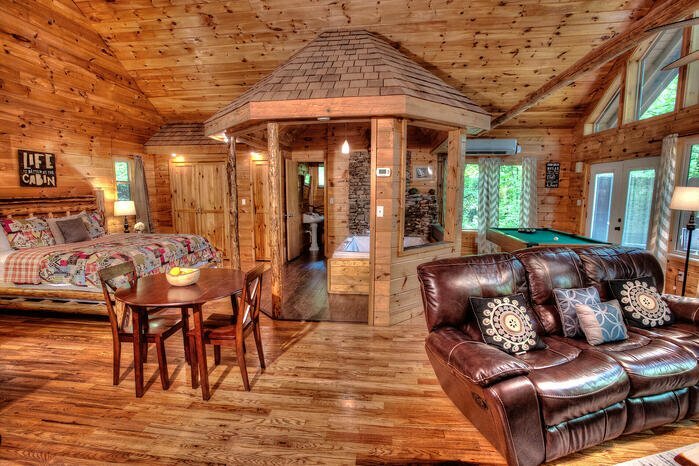 When you're taking in the natural beauty of North Georgia, the perfect nighttime accompaniment is a Cedar Creek Mountain Cabin. Nestled in the foothills, just a few minutes outside Helen, we offer state-of-the-art luxury mountain cabins with all of the amenities of an Atlanta hotel and with none of the noise, fuss, or traffic. Instead, you relax in the hot tub, or grill over an open fire, as the vast skies whirl overhead. Say, when is the last time you've seen the Milky Way? We've got it overhead every clear night here in Helen. If it's time to get away from it all, call Cedar Creek Cabin Rentals. 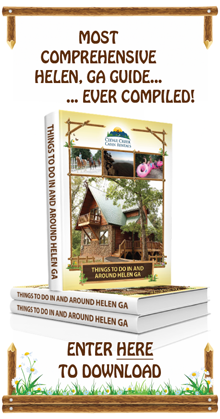 We'll help you build a Helen vacation you'll never forget! We've written several articles to help you plan the best romantic getaway in north Georgia. Explore our things to do hub, or visit the individual resources below. Where will your beautiful, scenic drive through northern Georgia take you?